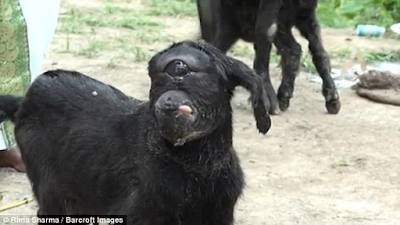 Villagers in Assam, India were astounded on 10 May when a goat gave birth to a one-eyed offspring. 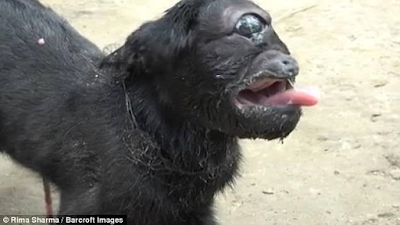 At the time, vets predicted that the blind goat, which also has only one ear, would die within a few days but it is still going strong and large numbers of people have been visiting the village to see the goat. Villagers believe the goat is sacred, with some locals beginning to worship the animal. 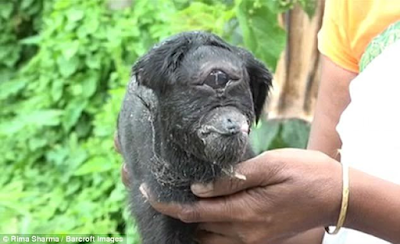 The goat suffers from a congenital condition known as cyclopia, it occurs when the left and right hemispheres of the brain do not separate as they are meant to early on in pregnancy. This leads to the formation of a single central cavity with one eye, or sometimes partially fused or separate eyeballs. 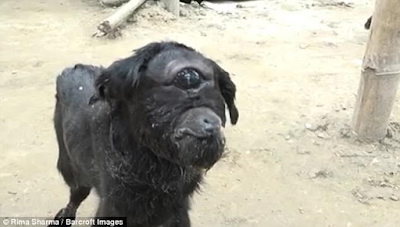 Other animals including horses, pigs, cows and cats have been known to suffer from the condition. Creatures with the condition are normally stillborn or die shortly after due to breathing and brain problems.